Showing 42 articles from March 2, 2016. LOUISBURG -- Two Franklin County men were sentenced to prison this week as prosecutors wrapped up two murder cases. On Monday, Cammron Torrance, 20, pled guilty to voluntary manslaughter for his role in the May 2014 death of David Wilkins Jr. He was initially charged with first degree murder. Also, in Franklin County Superior Court, Clifton Grady Hunt, 53, pled guilty to second degree murder for killing his mother, Sarah Faye Fields, in June 2015. LOUISBURG -- A Louisburg man was sentenced to probation for his role in an armed robbery. Prosecutors said Jeremy Wright, 24, earned such favor because he was key in taking down co-defendants. In May 2014, Franklin County sheriff's deputies arrested Wright, Kyle Anthony Clark and Darius Revel Robinson, all of Louisburg, charging them with first degree burglary, assault with a deadly weapon, conspiracy to commit robbery with a dangerous weapon, two counts of second degree kidnapping and felony larceny related to a March 15, 2014 incident in the Gold Sand community. 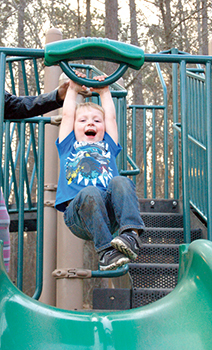 The big smile on the face of little Liam Abbott pretty much sums up the attitude of a lot of Franklin County people -- it's starting to feel just a little bit like spring! Although the first day of spring is not until March 20, slightly warmer days -- some reaching nearly 70 -- are beginning to spark a tiny epidemic of spring fever despite the chilly nights. LOUISBURG -- Candidates in contested local races shared a stage at Louisburg College Monday night and fielded questions from forum moderator Dr. Kelvin Spragley, a professor at the school. With about 200 in the audience, candidates for school board, district court judge and county commissioner were given a chance to introduce themselves and then fielded questions. LOUISBURG -- Candidates for Franklin County commissioner faced only two questions each Monday night after the election forum's format was tweaked to save time. Six candidates faced questions -- but two, Michael Schriver and Thomas Hart, did not attend the forum. Both Republicans, Schriver and Hart are facing each other in this primary contest for the District 5 seat. The winner is not slated to face a Democratic challenger in the fall general election. Before the questioning, each candidate was given a chance to define themselves and their goals. 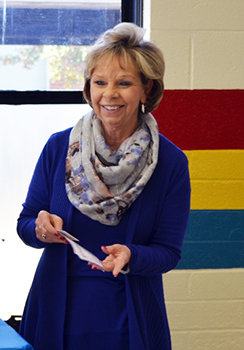 State Superintendent of Schools June Atkinson visited Cedar Creek Middle School this week to launch the 2016 North Carolina Teacher Working Conditions Survey. She visited CCMS to recognize teacher Valerie Hawthorne who was the designer of the 2016 logo for the survey. This the eighth time the survey has gathered feedback from teachers, counselors, principals and other administrators in public and charter schools. This year the survey is web-based and confidential, Dr. Atkinson told a small group assembled at the school. 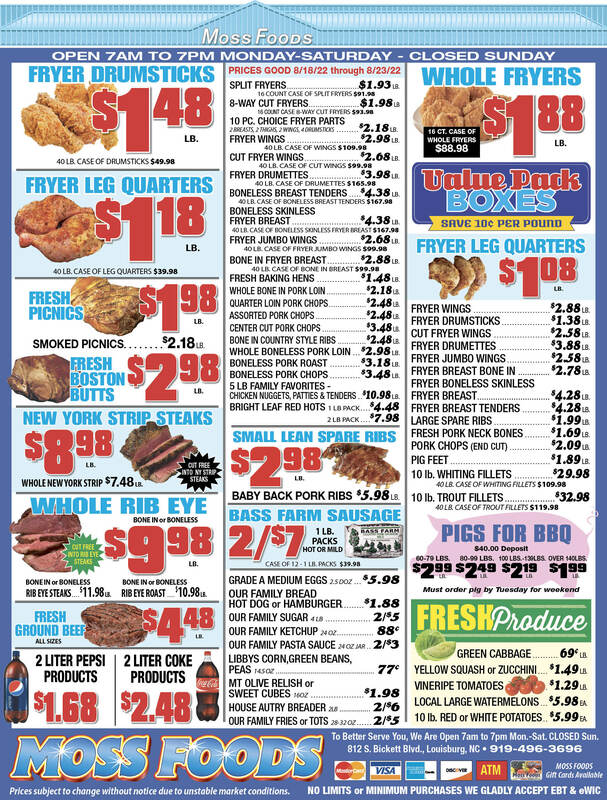 What's the best proof that spring is almost here? Although politics are in the air these days, there are better things to talk about. It's just around the corner and there are several ways to prove it. No, you can't go by the little spring flowers that are popping up. They often get ahead of themselves and, sometimes, end up encased in snow or ice as a result. Okay, fellow Franklin Countians, we have to get serious about this whole election "thing" that faces us this year. Today, March 3, was the first day you could cast a ballot in this year's unusual March Primary Election that, sadly, will actually settle some races in the county simply because there aren't enough candidates to face off in the November General Election. But beyond the primary -- and this is a major primary with significant local implications -- we are headed toward what could be a watershed election in November. The last column I wrote was about lines and fences -- particularly, that we are generally not a nation of fence sitters. Earlier this week, the city of Raleigh joined other towns, cities and states that made national headlines as an officer is accused of shooting a fleeing suspect. The officer in question is white. The man who was shot dead is black. 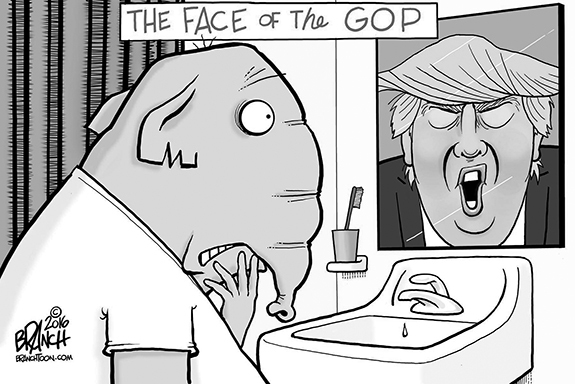 Politics is famous for October surprises. The radicals in Raleigh have one for you (more about that later). Apparently they had so much fun concocting it that they decided to surprise us in March also. Effective Tuesday, "Repair, maintenance and installation services," are now subject to sales tax in North Carolina. This came about as a result of the 2015-2016 State Budget. 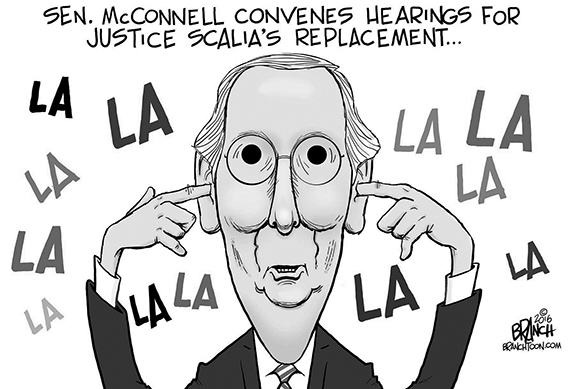 If you don't remember much about the budget I guarantee you'll hear about it from Republicans this fall bragging about how they slashed income taxes. Who decides what is or is not prosecuted? In the eyes of the law it is said everyone is equal. Wealth, family name, or political standing can be no shield from consequence for wrongdoing. Engraved on the front of the United States Supreme Court Building in Washington D.C. is the phrase, "Equal Justice Under the Law." The pursuit of justice is among the purest values a society can hold. For without true justice there is not a path to peace. This is true of men and nations. CLOSE CALL. Louisburg College's Matt Herzog (right) tries to beat out a grounder during last Friday's game against Marshalltown at Frazier Field. 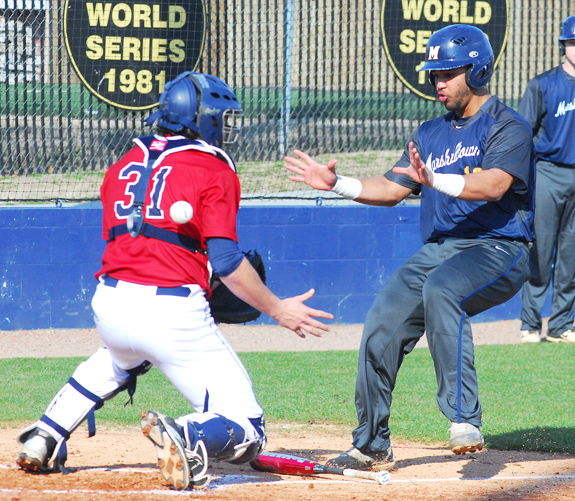 LOUISBURG -- Hard work is the foundation of Blake Herring's baseball program at Louisburg College, so it's no surprise that the Hurricanes have been battling the weather -- yet still getting on the field -- during the early portion of the 2016 diamond campaign. Louisburg's busy start featured five games last weekend, beginning with a meeting against Marshalltown CC (Iowa) in blustery conditions last Friday at Frazier Field on the LC campus. OUTTA MY WAY. 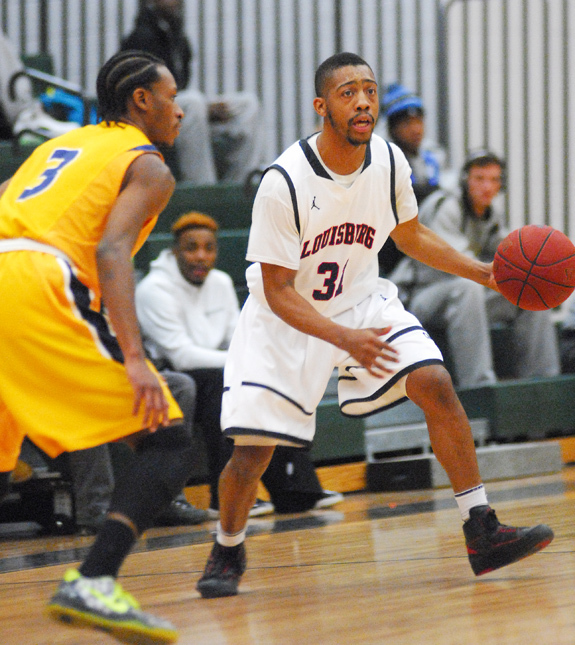 Louisburg College's Raekwon Harney (left) drives to the basket during Sunday's tourney decision against Wake Tech CC. 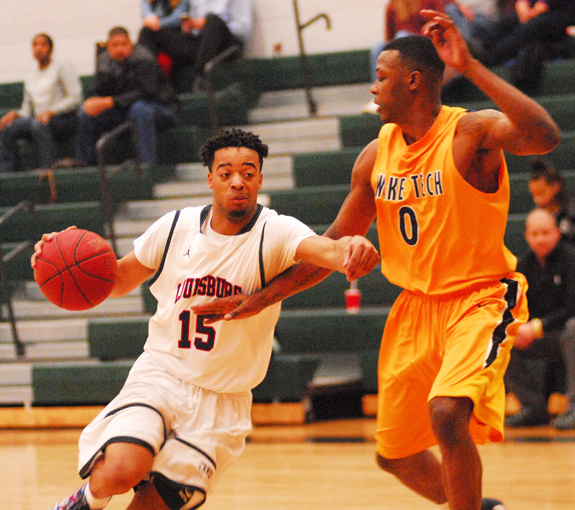 PETERSBURG, VA.- Even with their less-than-sterling finish in the league's regular season standings, there is something about the Wake Tech Eagles that provides a challenge for the Louisburg College men's basketball squad. 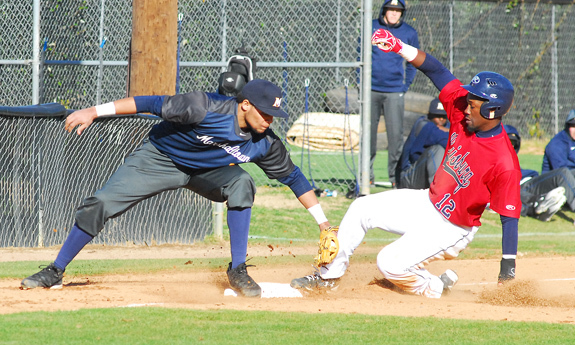 During the two regular season meetings between the clubs, the Hurricanes were never able to blow out the Eagles -- and that trend continued Sunday in the opening round of the Region X Tournament on the campus of Richard Bland College. TALL TASK. 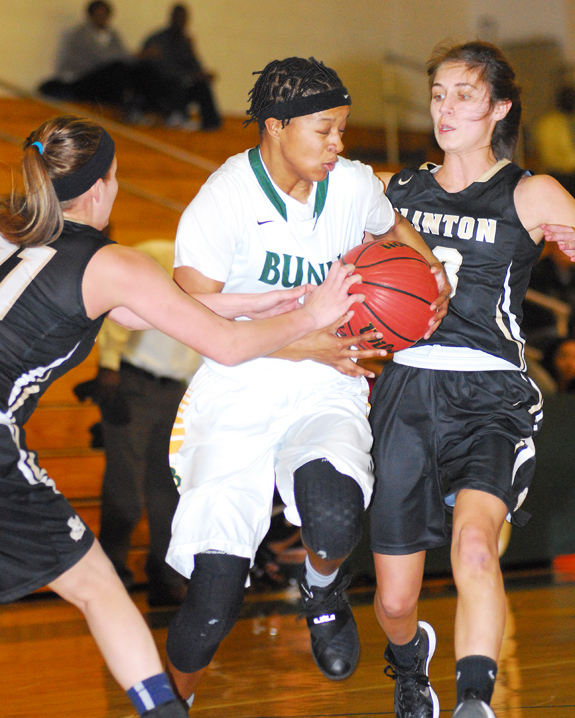 Bunn's Bernadette Cooke (right) drives during last Saturday night's road playoff showdown against North Pitt High School in Bethel. BETHEL -- Both in size and status, Bunn's challenge was destined to be a tall one at North Pitt in last Saturday's third round of the Class 2-A Girls Basketball State Playoffs. 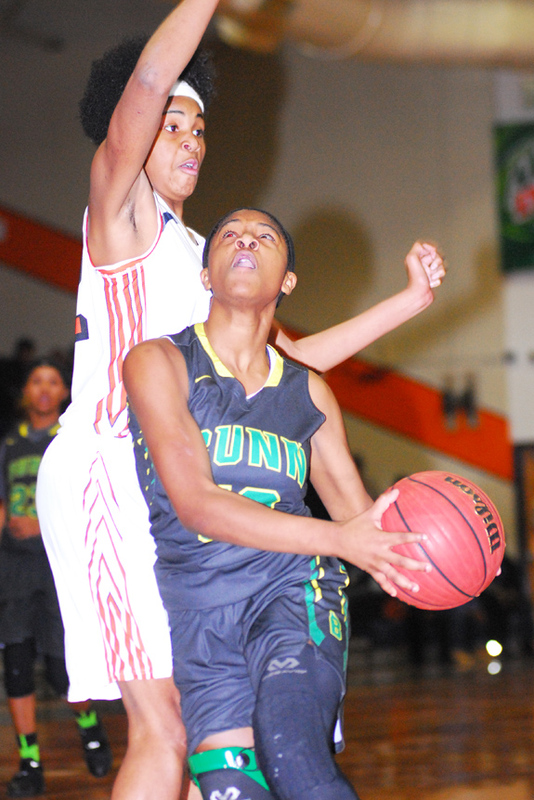 The host Lady Panthers entered with just one loss the entire campaign -- a setback against a touted Winston-Salem Prep squad during holiday tournament action. North Pitt is blessed with some talented, mobile post players to go with some solid performers in the backcourt. WALKER WON'T BE DENIED. Bunn's Precious Walker (center) drives between two Clinton players last Thursday. BUNN -- During their football playoff meeting last December, Bunn and Clinton would go down to the wire and into overtime before the Wildcats would pick up an emotional victory in the Eastern Regional Finals. There would be no such suspense when the schools reunited last Thursday, this time for a second-round matchup in the Class 2-A Girls Basketball State Playoffs. Bunn took an early lead and never relented en route to delivering a 60-39 decision over the Dark Horses at the Bunn Dome. THE RING'S THE THING. 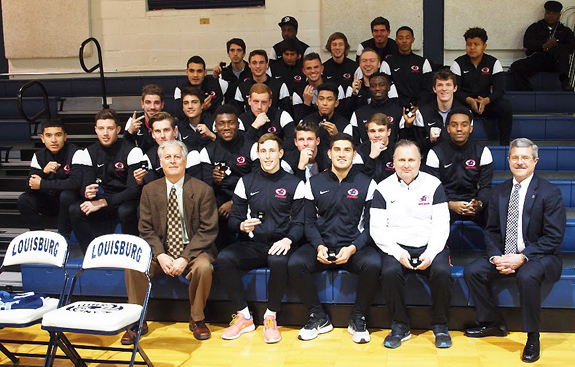 Members of the Louisburg College men's soccer team received their national championship rings last Thursday night. LOUISBURG -- Add another night to remember as part of Louisburg College's historic men's soccer season. The national-champion Hurricanes received their title rings last Thursday as part of a ceremony before a men's basketball game at Taylor Center on the LC campus. A total of 31 rings were presented. In addition to each player, LC coaches Martin Dell and Ted Awana were given rings along with trainer Mandy Kiger. "It was a great ceremony,'' said LC Athletic Director Mike Holloman. "The players were very excited to be getting their rings. SENIOR STAR. 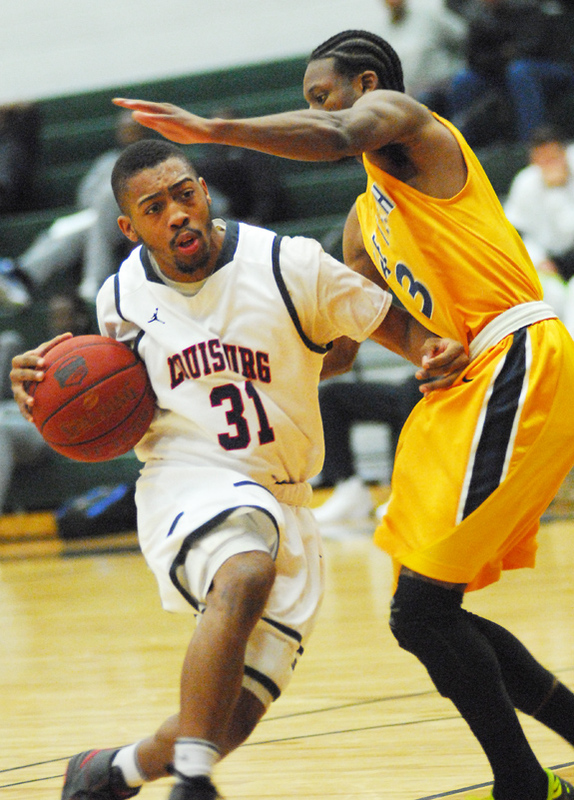 Calvin Manley enjoyed an outstanding senior campaign for Louisburg High School. LOUISBURG -- Mike Sheldon's first season as Louisburg High School's boys basketball coach featured a series of seconds -- and the potential prospect of even better things to come. The Warriors finished in the runner-up position in both the Tar-Roanoke Athletic Conference regular season and tournament standings before wrapping up their campaign with a second-round appearance in the Class 1-A State Playoffs. HENDERSON -- On Feb. 23, the Vance-Granville Community College Vanguards men's basketball team honored its departing sophomores, who went out on a high note, leading their team to victory at Aycock Recreation Center in Henderson. 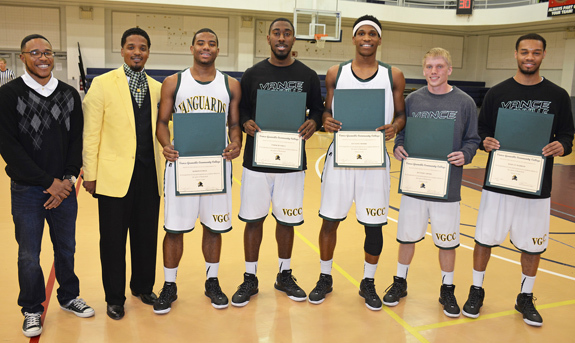 The 90-82 conference win over the Titans of Guilford Tech Community College marked the last home game of the regular season for the Vanguards. LOUISBURG -- Louisburg College is represented by two players on the All-Region X Women's Basketball Team for the 2015-16 campaign. 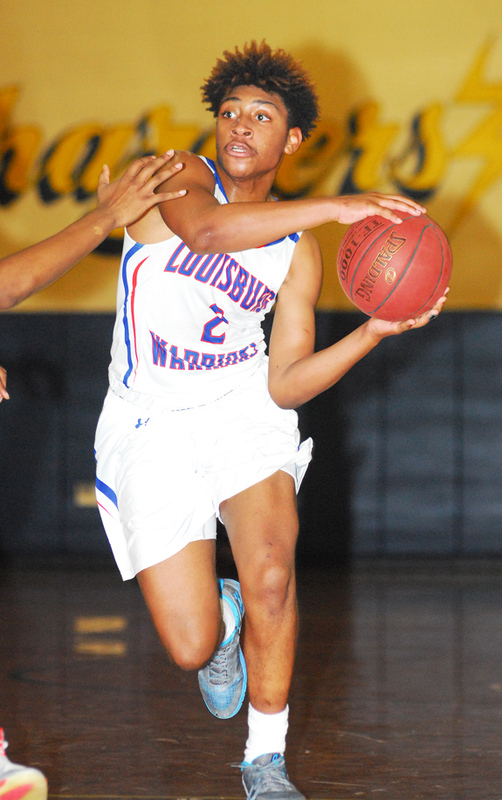 LC's selections are sophomore frontliner Iresha Cooper and freshman supersub Jasmine Covington. Cape Fear's Chris Harris was tabbed as the Coach of the Year, while Brunswick's Briana Baham is the Player of the Year. The Region X Tournament will be held this weekend on the campus of Brunswick Community College in Supply. LOUISBURG -- When he first saw Abigail Ross in action at Nash Central High School, Louisburg College women's soccer coach Andy Stokes knew she had the ability to be the Lady Hurricanes' No. 1 keeper -- and beyond. 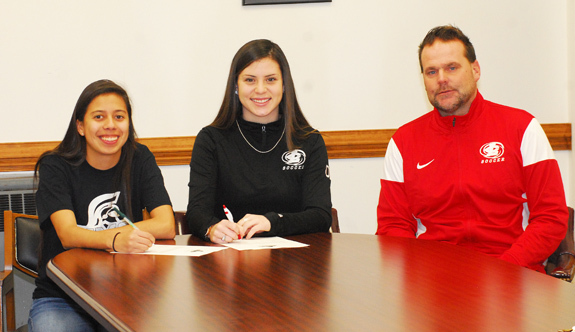 After two successful seasons at Louisburg, the 'beyond' part for Ross started recently when she signed a letter-of-intent to join the program at the University of Mount Olive. Louisburg College's Deshawn High (left) drives against a Wake Tech opponent during Sunday's opening-round action at the Region X Men's Basketball Tournament on the campus of Richard Bland College in Petersburg, Va.
Louisburg College's Raekwon Harney runs the show during Sunday's first-round victory over Wake Tech at the Region X Men's Basketball Tournament. Louisburg College catcher Seth Spillman (left) tries to come up with the ball as part of a close play at home plate last Friday afternoon. 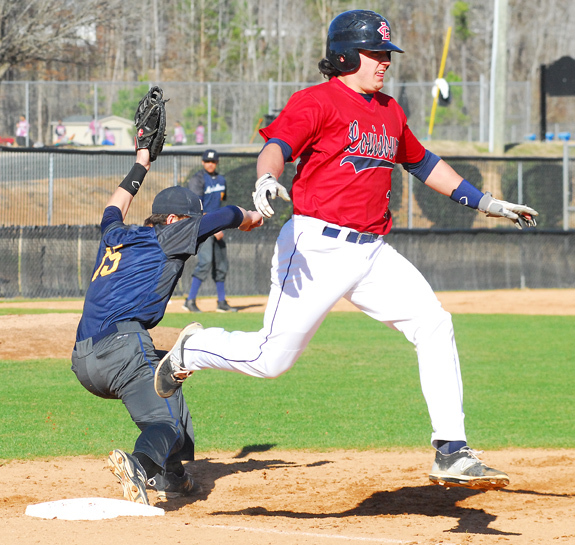 Louisburg College's Bryce Myers (right) steals third base last Friday against Marshalltown. It's almost Arbor Day! Why not plant a tree? Arbor Day in North Carolina will be March 18 this year. Take time to celebrate by planting a tree. Trees are a wonderful addition to any landscape, not only by providing an aesthetic complement but by increasing the quality of life and improving overall health. Since trees are such a large visible addition to the landscape, care must be taken to ensure proper growth and development. The Louisburg College Alumni association hosted an informal reception in the Norris Theatre on Feb 18, in honor of our Spring Artist-In-Residence, Walter Williamson from the LC class of '68. I am especially excited to welcome Walter back to the college since I was one of the Ladies involved in the Cast for the show Camelot, in which he played the lead role of King Arthur. A CELEBRATION. 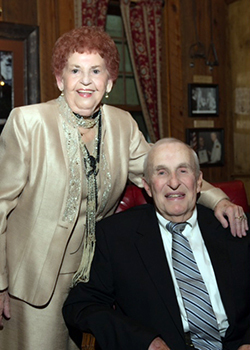 Bennie Ray and Mary Denton Gupton of Wood celebrated their 70th wedding anniversary on Feb. 21, 2016, in a private dining room at the Angus Barn in Raleigh. They were blessed to have all four of their children and all four of their granddaughters there to celebrate this occasion with them. According to management, celebrating 70 years of marriage was a rarity at the steakhouse. When asked the secret to such a long marriage, the couple said, "Sometimes you just have to be quiet and listen." Citizens in Franklin County's Epsom community made a strong commitment during the 1920s and 1930s to providing quality educational facilities for white children. Like the people in other county school districts, they took advantage of new funding opportunities, agreed to pay higher taxes for construction of a new school, and operated a strong parent-teacher organization. After World War I, existing schools in North Carolina were inadequate for the rapidly expanding number of children who needed to be educated. 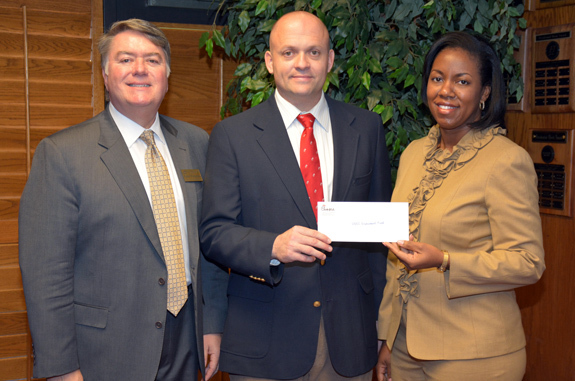 From left, Vance-Granville Community College Endowment Director Eddie Ferguson, Josh Towne and Dr. Stelfanie Williams, VGCC president, mark the creation of the new Chick-fil-A of Henderson scholarship. Louisburg College is welcoming one of its own, Walter Williamson, back to the campus this spring as artist in residence. 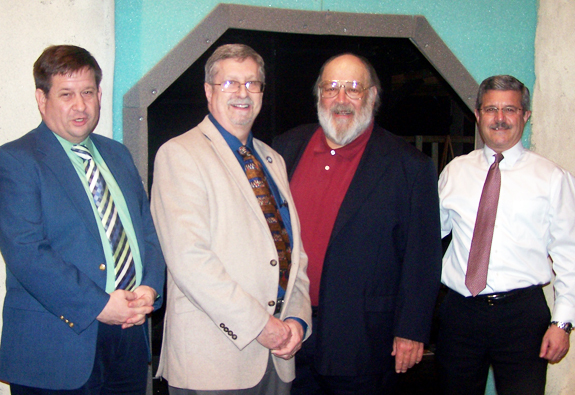 Shown here are (left to right) Jim Eck, academic dean; Walter Hurst of the drama department; Williamson; and Louisburg College President Mark La Branche. Williamson graduated from Louisburg College in 1968 and has gone on to perform on both the stage and in Hollywood films. LOUISBURG -- When Louisburg sweet potato farmer Jason Brown was starting out in agriculture, he often turned to YouTube videos to learn the latest techniques. 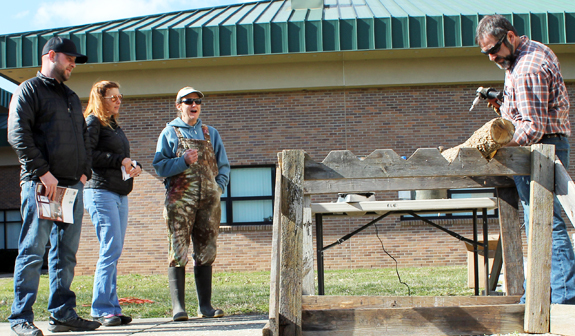 At this past Saturday's Successful Small Farms Opportunities Conference, organized by the North Carolina Cooperative Extension Service and the Franklin County Small Farm Association, Brown was able to connect with experts in person. "Especially in today's agricultural climate, you have to be on top of new practices -- there are so many things you can do to maximize your land," Brown said. 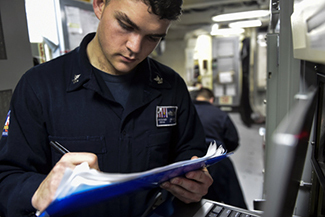 Information Systems Technician 3rd Class Joel Williams, from Franklinton, monitors ships Internet connectivity aboard the USS Carney last month while out in the Mediterranean Sea. Carney, an Arleigh Burke-class guided-missile destroyer, forward deployed to Rota, Spain, is conducting a routine patrol in the U.S. 6th Fleet area of operations in support of U.S. national security interests in Europe. Bye, Debbie! Best of luck! FOND FAREWELL. Franklin County Schools bid a bittersweet farewell to Debbie Williams, long-time clerk of the county's Board of Education and a pillar of the school system. 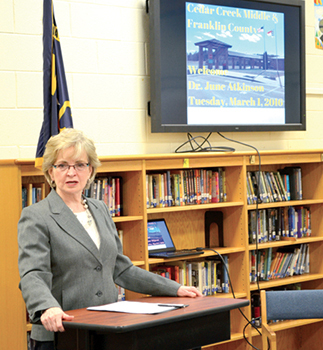 Her retirement was effective at the end of February after a 30-year career that began in Franklinton City Schools and continued with the county system after the two systems merged in the early 1990s. At her retirement luncheon, Williams, right, was praised for her work, accuracy and positive personality. RALEIGH -- A former highway patrol cadet's case against two troopers is with the jury. Attorneys for a Franklin County sheriff's deputy suing two State Highway Patrol troopers allege the officers sought to break her and wash her out of the trooper training program. 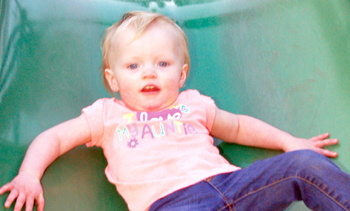 Their malice and negligence, plaintiffs argue, caused a debilitating hip fracture. During closing arguments on Tuesday, defense attorneys accused the plaintiff's attorneys of dazzling the courts with shiny balls of circumstances that don't prove the cadet program instructors acted with malice or beyond the scope of their duties. FRANKLINTON -- Franklin County got off lucky last week as a storm packing blistering rain and swirling winds spared life and limb. It did send a tree crashing into Robert Pendleton's home, though. He was standing in his hallway just before 6:30 p.m. on Feb. 24 when it hit the back of the house on Ramey Circle. Pendleton was not hurt, just shaken up. LOUISBURG -- Franklin County sheriff's deputies are looking for suspects that shot into an occupied home. Residents inside a home in the 400 block of East River Road reported the afternoon of Feb. 27 that they were in their home the night before and heard a loud bang at about 1:30 a.m. The Cardinal Innovations/Five County Community Operations Center's Consumer and Family Advisory Committee (CFAC) meets to assist in developing and revising the mental health plan that drives mental health, developmental disability, and substance abuse services for the five county area. Individuals are invited to attend the CFAC meetings on the second Tuesday of every other month beginning at 6 p.m. at the Vance-Granville Community College--Warren Campus, 210 W. Ridgeway Street, Building #4, Room W-4104, Warrenton. Care and Share of Franklin County has received $2,500 from the Food Lion Charitable Foundation and will use the gift to provide emergency food for individuals and families who find it difficult to provide nourishing meals for their households, officials said. "The support from Food Lion is a prime example of the partnership that Care and Share strives to have with local businesses and we greatly appreciate this generous gift from Food Lion," said Nicki Perry, director. Union Bank & Trust Company, a community bank based in Oxford, reported net income of $92,000 for the fourth quarter ending Dec. 31, 2015, compared to net income of $369,000 for the same period in 2014. For the year, the bank reported net income of $1,261,000 in 2015 compared to $1,620,000 in 2014.